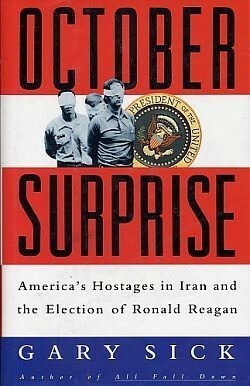 "Did William Casey, without the knowledge of the U.S. government, travel to Paris during the period of October 15-20, 1980, and there meet with Iranian and Israeli representatives to arrange the release of the U.S. hostages to the Reagan-Bush forces in return for promises of military equipment?" Sick answers in the affirmative, and draws ominous conclusions about what he calls a "covert political coup" challenging the legitimacy of the whole political order in the United States. But Sick ends up discrediting himself rather than proving Republican Party treason. He gets elementary facts wrong: the date of Saddam Husayn's ascendance to the presidency of Iraq on page 86, for example, is off by a year. He is indiscriminate with sources; Steven Emerson in The New Republic and a Newsweek team independently have shown them all to be a self-promoters, con men, and criminals. At the same time, Sick is overly selective with evidence, choosing to ignore the proof that many of the incidents cited in his account - including the key Paris meetings - have been conclusively disproved. Worst of all, Sick accuses U.S. government officials of lying, yet he appears less than honest himself. In a May 2, 1991 article in The Wall Street Journal, this writer revealed that Sick had already in the fall of 1988 endorsed the October Surprise thesis, when he told The Rocky Mountain News "At first I dismissed this, but not any more. I'm convinced on the basis of what I heard that there were some meetings in Paris." Shortly after, Sick was confronted in person with this evidence on a national television show. Still, Sick maintains the fiction of a later and reluctant conversion to the October Surprise theory; he writes on page 209 that during the 1988 presidential campaign he "was unwilling to endorse the allegations [of Paris meetings] as true." Why stick to so obvious a falsehood? To make his story more convincing? Or has it something to do with the $500,000 he got for the movie rights?